Pallet Racking the Ultimate Convenience -Choosing the best system of pallet racking for your business is very important whether you have a warehouse, shopping outlet, archive room or library. Pallet Racking and shelving storage systems have become increasingly popular throughout the world and over the years there has been much done in the way of improvements and quality. Buying pallet racking new or second hand from Advanced Handling & Storage allows you the choice of all the major manufactures within the industry including Dexion, Planned Storage Systems (PSS), Hi-Lo, Apex and Link 51. Advanced Handling & Storage will help you assess what system will best suit your needs in terms of environment (cold storage racking systems are also available from Advanced Handling & Storage Ltd), your budget and storage area and facility. 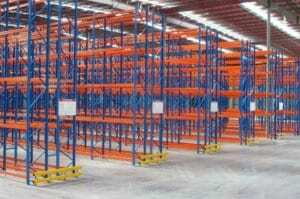 The team of experts dealing with your pallet racking inquiry will also look closely and what you are intending to store and palletise so to ensure that you receive the best storage system If you have a warehouse, then it is very important to have useful warehouse equipment like Pallet Racking, drive in racking, storage racks, etc. and remember that you can always go up with a mezzanine flooring system. For further information on any of our products including new pallet racking systems, second hand, used and pre-owned pallet racking, industrial flooring, mezzanine floors, archive shelving units or items from our catalogue available online then please do not hesitate to contact our sales team on 0800 345 7088 or 01388 779111 or drop us an email at sales@advanced-handling.co.uk and we will respond as soon as possible.